Inspired by David Leonhardt, here’s the graph to show any of your friends who think that inflation might be a problem thanks to Fed monetary policy or deficit spending. 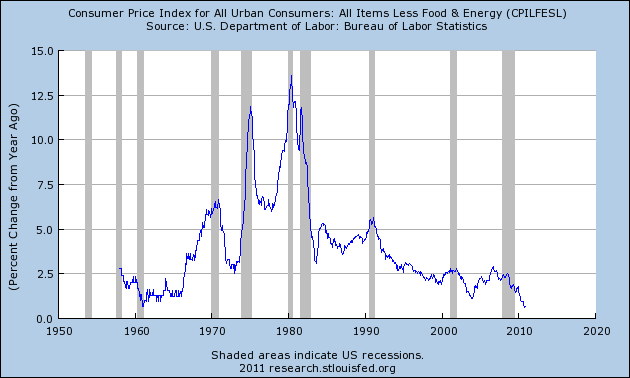 It shows core inflation (inflation minus food and energy) over the past 50 years, which is a good way of visualizing basic inflationary trends in the economy without getting distracted by normal swings in volatile commodity prices. Right now, core inflation has been trending down steadily for four years and is as low as it’s been since the end of World War II. There’s no evidence that food and energy prices are feeding through to core inflation, and no evidence that there’s even a trace of broad inflationary pressure in the economy. It’s just not there. Employment and growth are our problems, not inflation.